Whenever we plan for anything, we have a habit of writing down, because that makes the whole picture clear, with all the requirements in front of us. Similarly, while desigining and developing a software or a game, you must prepare a blue print of what you are planning to create and the resulting product. UML stands for Unified Modelling Language and can be used to visualize the various features of the game using UML diagrams. UML diagrams are not only made for software/game developers but also for, business managers, engineers, common people and anybody who is interested in understanding the system and the graphical representation makes it easier to understand. The system(visualized and constructed using UML) can be a software or a game or any other civil or mechanical projects as well. To understand conceptual model of UML, first we need to clarify; What is a conceptual model? and Why a conceptual model is required (at all)? A conceptual model can be defined as a model which is made of concepts and their relationships. This is made even before the initial planning of how things will work. This showcases the early concept and relationships. A conceptual model is the first step before drawing a UML diagram for any project. This helps to get a broader and holistic picture of what is going inside your mind. Any game is not just good graphics and a task to complete, there is a complete storyline, and different decisions and actions will lead to different outcomes. Hence to make sure of all this, a flow chart is created with all the different flows and possibilities mentioned, which is the UML diagram. For large game/software projects, a single UML diagram cannot accomodate the complete design, hence multiple UML diagrams are created. 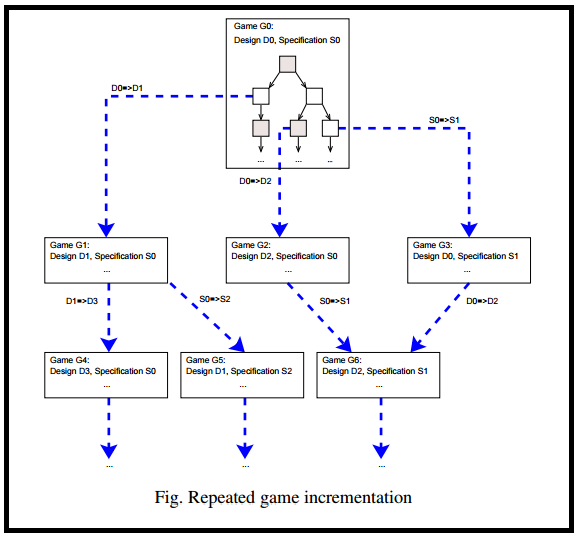 For instance, if in the below diagram, Game G0, G1, G2 etc are various stages of a Game, and based on the decision that the player takes, you advance to the next stage, so this UML diagram below is only showcasing, which decisions will lead to what. There will be separate UML diagrams to define each and every stage of the game. Game G1 will have a separate UML diagram in which the details and steps of the stage Game G1 will be designed. UML being a very well developed language and being universally accepted, makes it the perfect choice for this purpose.